Reading the Fantastic Four comics from the start. The Image Comics revolution was in full swing in 1992, and here is Marvel trying so very, very hard to catch up in issue #362. We begin with a lot of weirdness in Reed’s lab. He has a device on his head, he’s crackling with energy, and he has phased his hand into a piece of wood. Reed explains to Sue that physical matter, on a particle level, has empty spaces within it, and he wants to access that empty space and explore whatever wonders he might find there. 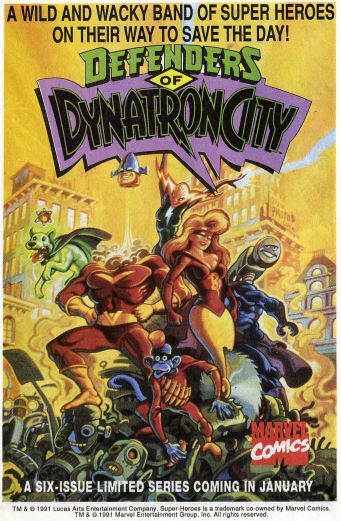 We then cut to, according to the caption, “A universe far beyond the fragile fabric of conventional reality, in a dimensional plane which exists at the juncture of all physical matter.” In this space, we meet Wildblood, a mercenary thief, who has just snuck out of a futuristic city having stolen some valuable gems. He sees Reed’s hand stretching through into his dimension, and he believes Reed is a member of the Gem Guild, who is after Wildblood. Reed’s hand disappears before Wildblood can properly attack. Back on Earth, the tabloids have reported that Johnny and Alicia have broken up (but not with the knowledge the Alicia had been replaced by a Skrull the whole time). Spider-Man is seen reading this (he reads the tabloids?) and thinks that he should drop by later to visit Johnny. He doesn’t need to, though, because his next stop is Empire State University, where Johnny is considering returning to college. He then signs autographs outside, only for his Fantasticar to be attacked by a bat-shaped creature. Turns out it was made of Spider-Man’s webs. 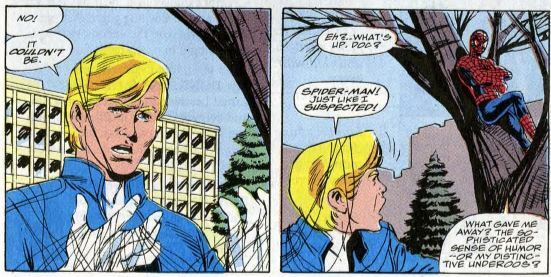 Spider-Man heckles Johnny, getting him angry. Spidey then leads Johnny on a chase through the skies over New York. This goes on for several pages, with Spider-Man using his webs to counter Johnny’s powers. Johnny manages to get a hit in, singeing Spider-Man. Johnny worries that this has gone too far, only for Spidey to turn the tables and wrap up Johnny in his webs. Back at headquarters, Reed continues his experiment. In the other dimension, Wildblood is fighting men riding dragon-like Sky Serpents, who want back the gem he stole. Wildblood sees Reed’s hand again, grabs it, and follows it back to Earth. Wildblood thinks Reed is a member of the Gem Guild, and immediately starts fighting. Wildblood has superhuman strength and agility, and his main weapons are two staffs called kalis that can fire energy beams. Franklin wanders into the room during the fight, and Wildblood takes particular interest in him. Back out in New York, Spider-Man tricks Johnny into flying straight into a water tower, which douses his flames. He and Spidey exchange a few one-liners, and they’re friends again. In the other dimension, the soldier types were chasing Wildblood figure out how Wildblood escaped them, tracing his trail to the spot where he fled to Earth. 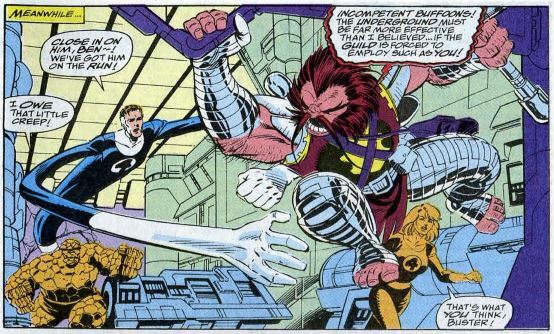 Back at HQ, Sue has trapped Wildblood within a force field, while Reed ponders how to return him to his home dimension. Behind him, a portal opens in the piece of wood. Sometime later, Johnny returns to HQ with the alarms going off. He finds Reed and Ben recovering from unconsciousness. Reed says strangers came through the portal and abducted Sue and Franklin, and the team must go into the other world for a rescue mission. 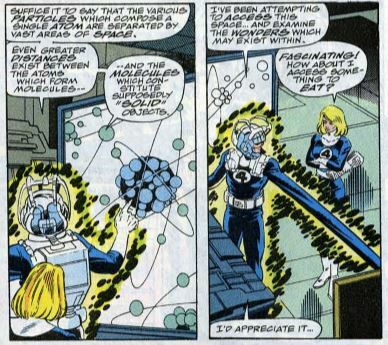 Unstable molecule: Reed’s name for the other dimension is the “inniverse,” in that it’s the opposite of the universe. Let’s all be glad the name didn’t catch on. Fade out: Sue has been demoted back to “bickering wife” status of the early ‘60s, wanting Reed to stop working in the lab because she just made his lunch. Yeesh. Clobberin’ time: There’s a reference to Ben and Franklin playing “Super Genesis,” which I guess the Marvel Universe’s version of the Sega Genesis. 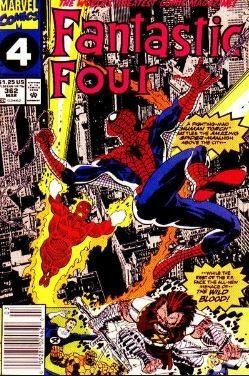 Flame on: What, exactly, was Spider-Man doing by starting a fight with Johnny? Was it all a ruse to cheer Johnny up, or was he really that upset about what he read in the tabloid? The comic doesn’t actually say. Four and a half: Franklin is back to bugging his parents about visiting Disney World, even though they took him to Epcot at the end of the Acts of Vengeance crossover. Commercial break: This was a collaboration between Marvel and Lucasfilm. Now that the two are back together, think there will be a revival? Fantastic or frightful? 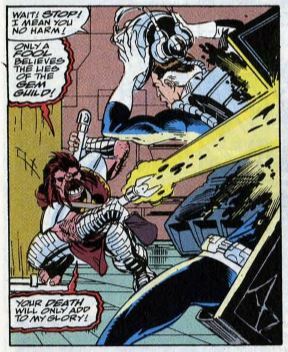 This Wildblood guy is a way-too-obvious attempt to cash in the popularity of what Image Comics was doing at the time — armor with big shoulder pads, lots of pouches, covered with oversized weapons, and a bad attitude. But it lacks the “indie rock star” feel that made those early Image books so successful. Also, I’m always up for a good Spidey/Torch team-up, but this one’s here for seemingly no reason. A misfire.